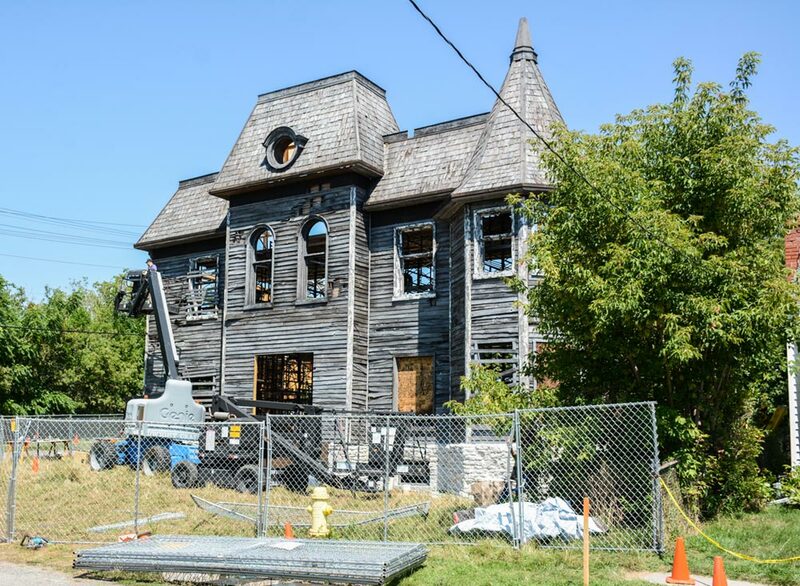 Crews have been hard at work putting together a haunted house on James Street to be used in the latest film adaptation of It, Stephen King’s horror classic. The scene is near the former Fittings Property. Mike Bruce, the movie’s location manager, says Oshawa has everything needed by Andrés Muschietti, the film’s director, to fulfil his vision. The film is just the latest to set up shop in Oshawa. It is a fairly quiet piece of Oshawa, hidden away behind the crumbling remains of Oshawa’s Fittings Property. Up until a few weeks ago, there was not too much remarkable about the empty lot, tucked into the bend of James Street off of Eulalie Avenue. That was, until Hollywood showed up and started building a haunted house. The site, to be used in the coming weeks for shooting scenes as part of the latest film adaptation of Stephen King’s 1986 horror novel It, has seen a steady flow of onlookers coming to get a glimpse of the building. It is not known what the house facade will be used for in the movie, and location manager Mike Bruce tells The Oshawa Express he cannot share those details. However, he does say the location in Oshawa is perfect for what director Andrés Muschietti had in mind for the particular scene. “I’m not allowed to say too much as the producers like to OK anything that goes out to the media,” Bruce says. The film is set to focus on the first half of Stephen King’s 1,000-plus-page tome, which follows a group of friends in the summer of 1989 as they attempt to stop the evil presence lurking beneath their town. The creature hunts by using children’s worst fears against them. While generally taking the form of a clown (made famous by Tim Curry’s personification of the character in the 1990 TV miniseries adaptation of King’s work), It also takes the form of many creatures throughout the novel. The second half of King’s book, which is also planned to be filmed as a second movie, takes place when the same kids are adults, forced to return to their hometown when It returns. While it may be unsettling to know Oshawa has everything needed to shoot a horror movie, it is not the only movie using Oshawa as a backdrop this year. As a matter of fact, more movies are choosing Oshawa than ever before. “Permit activity is expected to surpass previous years on record,” says Mary Cousineau, a staffer in Oshawa’s economic development services department, which handles filming permits. To date, the city has issued 16 permits, all free of charge, to two feature films, a TV series and other projects such as music videos, commercials and student films. Even with that, Cousineau says the filming office might not be aware of all the filming that takes place here due to the fact that companies do not need permits to film on private property. For Bruce, he says the work leading up to filming has been a great experience for everyone involved. “It has been a pleasure working with the city and residents of Oshawa up to this point,” he says. Filming for the project is set to get underway in the coming weeks, following which the set will be dismantled and towed away, hopefully along with any lingering spirits.